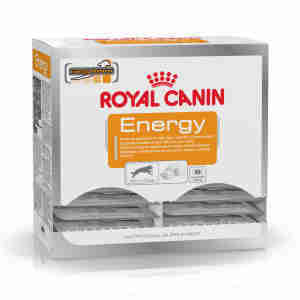 Royal Canin Energy is a calorie-rich nutritional supplement for dogs in form of a treat. Provides an energy boost that is suitable for active adult dogs with high energy requirements. The nutritional supplement Energy contains a high level of short-chain fatty acids which contribute to a rapidly available, high level of energy in order to support the activity and performance of dogs. Contains reinforced levels of antioxidants (vitamins E & C, polyphenols) which help neutralise free radicals. Exercise stimulates the production of free radicals which are responsible for oxidative stress in cells. Rice, animal fats, vegetable oils, wheat gluten*, vegetable protein isolate, dehydrated poultry meat, hydrolysed animal proteins, beet pulp, vegetable fibres, fish oil, minerals, fructo-oligo-saccharides, green tea and grape extracts (source of polyphenols). Protein: 27% - Fat content: 36%- Crude ash: 3.6% - Crude fibres: 2% - Polyphenols: 150 mg/kg. *L.I.P. : protein selected for its very high assimilation. of excess weight which could affect the animal's health. Always ensure that there is clean, fresh water available. My dog does Flyball and this helps his energy levels whilst competing! Bought to help dogs stamina whilst doing fly ball! These live up to their name they had peppy running around in spurts of excitement, I bought 2 bags he thoroughly enjoyed them.